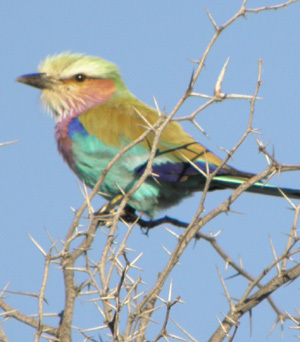 Picture top right: The famous Lilac-breasted roller of the Kalahari... a rose among the thorns! We love this bird and its colors never cease to amaze us. 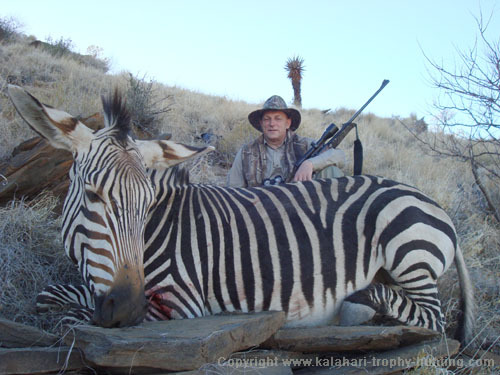 We are nearing the end of our trophy hunting season 2010. And what a year it was! We planned to send out issues of our Newsletter more often to be able to share more special pictures. However, we just couldn't find time to sit down at the PC and do it. We like to give our best for each client and hunter and therefor rather spend time hunting, cooking, preparing trophies and sitting around the campfire sharing hunting stories and life's experiences - than typing on the computer! So we apologize for the "quietness" in terms of the Newsletter, but we know also that you as hunting friends will understand. We are now looking forward to meet Bryce and John Millar from Idaho, USA. They will be our last international hunters for this year. 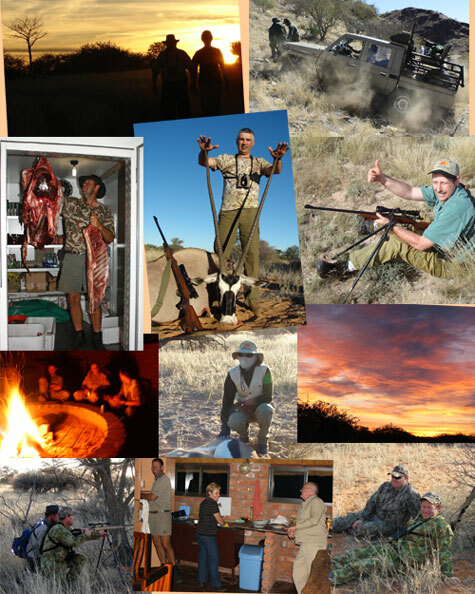 During 2010, hunters and their families and/or friends visited us from Ghana, UK, Qatar, Russia, Australia, USA and Hungary and many special trophies, moments and experiences will be remembered for a long time. In the next two issues of our Newsletter we would like to share not only hunting pictures of this year, but also some of our experiences: the roses and thorns; the ups and downs; the challenges and successes; the hope and despair; the gaiety and melancholy; the better and worse days, of work and rest at dusk and dawn, on clear and cloudy days - and of course, the ever-presence challenge of hunting! We want to thank each and every hunter and hunting group who hunted with us this year. It is such a privilege to get to know so many people. You enriched our lives in many ways and together we could keep on learning from nature and the wonderful abilities of the creatures therein. Each hunt are different in some or other way, because circumstances in nature are different every day and one never knows what the veld has to offer a specific hunter on a specific day. Therefor the logistics of hunting have to be carefully planned. After each day of hunting, there are the most important to be taken care of: the trophies. This is a tedious and time-consuming job to slaughter each trophy's cape to the tips of its nose, lips and ears. This job is often done till late at night. After the slaughtering process, the skins have to be washed and hanged out for a while before it is salted in a shady place. We have three slaughterers who help with the big job. Three or four days later, these skins have to be folded neatly - ready for delivery to the taxidermist, who does the last part of this job. Since the trophies are the token of each hunt, it needs our careful attention and care to ensure it arrives in top condition at our clients' homes. Then there is also the meat of each animal that needs to be hanged in the walk-in coldrooms to be sure it stays in top condition, because each part of the meat we hunt, are used by someone locally. 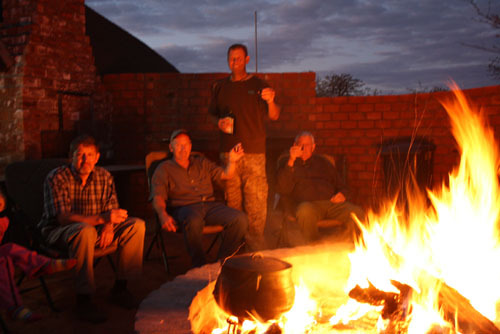 Picture: The three guys who've done all the practical planning, driving, locating of animals, guiding, stalking and tracking on all our hunts this year: father and son Hendrik and Michael with friend Dawie. Dawie helped out on the guiding of bigger groups. We had only a very few "disappointing" hunting days this year when a hunter didn't get what was planned to be hunted for that day. However, for any 'real hunter' this is not a problem, because to be out in nature on the homeground of all these special created animals, and to experience their exceptional senses, are special in itself. Hunting teach us as human beings some patience and perseverence. The Langley family started off our hunting year with a hunting-and-fishing trip. We first went to the coast of Namibia and, although we only got a few fish, it didn't lessen any of the joy of being together as special friends. The Langleys are originally from South Africa, but work currently on a gold mine in Ghana, Africa. Roy love the taste of good Whiskey. He knows the history, the origin and processes involved in every Whiskey. He was kind enough to bring and share very special Whiskey with his PH! Denise, Roy's wife, is quite scared of certain bugs. It happend twice while she was driving with me that a huge dung beetle flew in the window and landed on her lap. I found her reaction hilarious! Thank you, Denise... I still see that "clip" in my memory and then can't help to laugh again. After Roy and his family, we had Christiaan Gouws from the UK. He and his wife grew up in South Africa so we could talk with him in our home-language, Afrikaans. Christiaan is a dentist and currently working near London. He brought us some tasty Scottish shortbread and also English tea for our enjoyment. We still enjoy a cup of English tea every now and then, Christiaan! Find further on in this Newsletter the hunting pictures and -stories of hunters we had from April to mid-July. The new free Kalahari wallpaper for you this month, is a picture of Brooks Rollings from Florida. 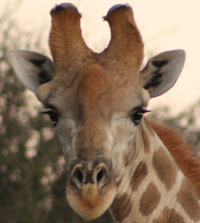 He took it while we were in Etosha. Thank you, Brooks, that we all can share in your special picture of this Etosha-lion. 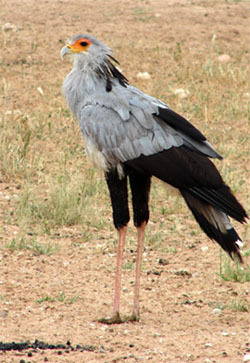 Here in the Kalahari we have a bird called the Secretary bird. It is about 1.3 meters tall. It prefers to walk, like the ostrich, because it finds most of its food on the ground. But, it CAN fly like most birds and only does so when hard-pressed. It eats lizards, rodents and snakes. It would stamp on the prey until it’s dead. The legs and feet are covered with thick scales to protect it from harm from the snakes. After it killed it, the canny bird would 'swallow' it whole and store it in his crop. When he gets to his home, where the young ones are waiting, it would bring up the food and the adolescents would eat it. The Secretary bird is our friend, because it could keep the snakes from coming to our homes and bother us. These three hunters from Qatar hunted with us in May. 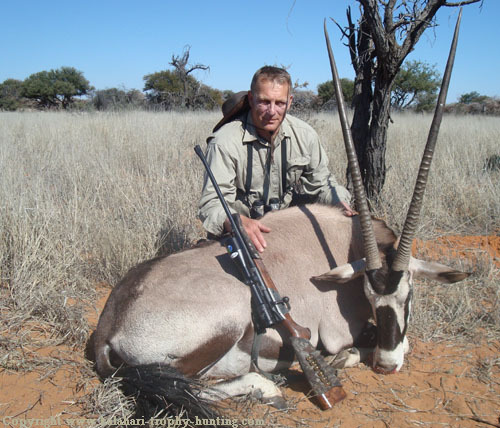 They booked a management hunt and hunted several Springbok, Gemsbok, Kudu, Impala and Steenbok. 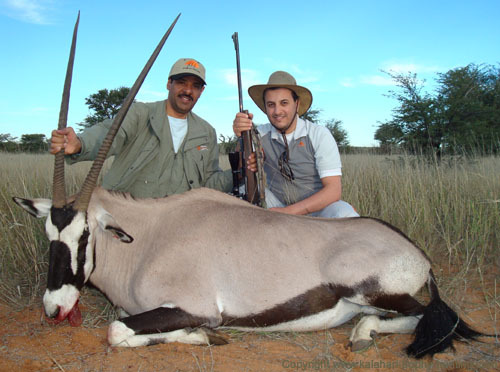 Above: Mohammed and Ahmed with a Gemsbok Mohammed took. The Qataris arrived with a huge bag with some interesting content. 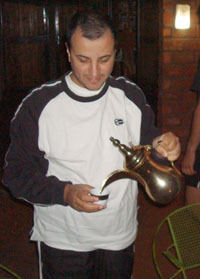 Among these things were special coffee-beans, a copper coffee kettle together with small, gold-rimmed cups; very tasty spices like Madras curry powder and saffron, Basmati rice from India and also some very delicious dates from Qatar. They added some saffron spice to the Basmati rice we cooked for them. Saffron has for decades been the world's most expensive spice by weight and adds a yellow coloring and special flavour to rice or whatever it's added to. It costs ± U$3000 per kilogram! We were privileged to be treated with this expensive spice and we liked the taste. We just couldn't get used to their coffee. Sorry, guys! 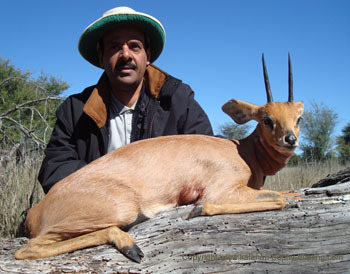 Picture: Mohammed got this beautiful trophy Steenbok. 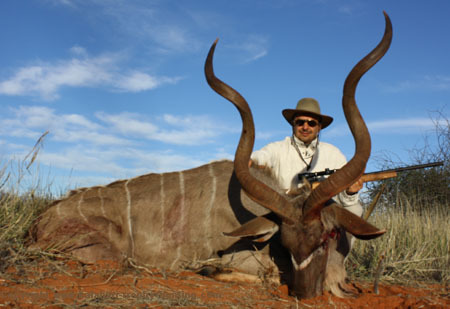 Above: Turki with a Kudu. Turki watched carefully how we prepared their meals. In the end, I got used to him watching over my shoulder ;o). They enjoyed all our game meat. 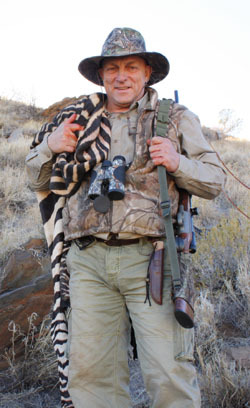 Victor Berezov hunted with us in June and got 1 Hartmann's and 1 Burchell's Zebra, 2 Warthogs, 2 Springbok, 2 Steenbok, 2 Impala, 1 Kudu, 1 Gemsbok and 2 Duiker. 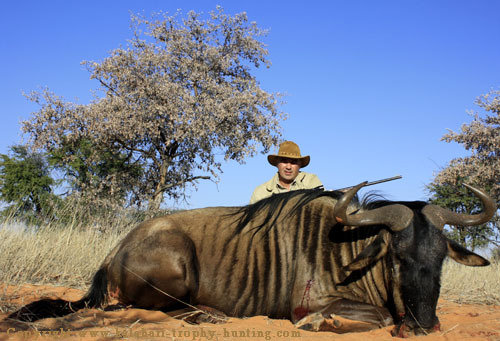 Pictures: Victor shot his Hartmann's Zebra on such a high and steep place on the mountain that it had to be slaughtered there. The meat and skin had to be carried to the vehicle. Victor carried his Zebra skin. Victor's bullet pierced the heart of the Zebra. It was a perfect shot with his Blazer. The guys were very impressed with Victor's Blazer. 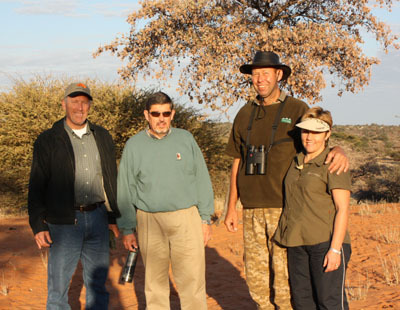 They found it a superb rifle for our conditions and Victor put it to good use here in the Kalahari. Victor brought us some beautiful Russian music. The children still dances in our home when some of that music is playing. Above: The Kudu the veld had to offer Victor here in the Kalahari. 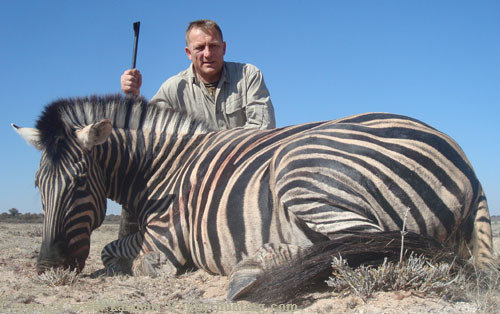 Above: Victor with his Burchell's Zebra. Compare his two Zebra pictures to see how the Burchell's and Hartmann's Zebras differ. 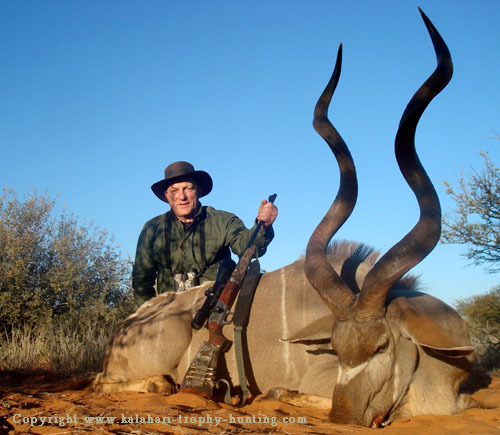 Above: Victor with his 40" Kalahari Gemsbok. Victor and Michael walked hard every day of Victor's hunt to get these trophies. Victor enjoyed the challenge and were physically fit for the hunt. Thank you, Victor, for giving special attention to the children. Isabella still talks about "my friend Victor". We're looking forward to see you again in April next year. In June/July six of our Reformed churches here in Namibia had the privilege of a formal visit from delegates of the PRCA (Protestant Reformed Churches of America). At the end of their formal gatherings and visits to church members in northern and western Namibia, they had three days to visit us here in the Kalahari on the far-eastern border of Namibia. Three days went by like the wind. We had so much to share and to talk about. It was a wonderful experience to meet people from the other side of the globe who share our mutual reformed faith. Above: Around the fire with profs Gritters and Dykstra from Protestant Reformed Churches of America. 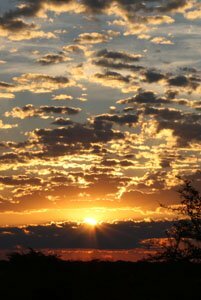 Above: A walk in the veld to enjoy the wonder of creation. You can read more about this precious faith and doctrines on the PRCA website. In mid-July we had Igor Shakhidzanov and Igor Mikailov from Russia. With them came a friend, Olga. They booked their hunt at a very late stage this year and we couldn't believe that they could get flight tickets, especially with the World Cup Soccer that was in South Africa at this time. 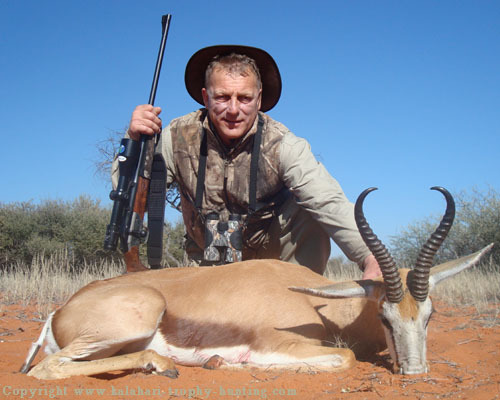 This Russian hunters got the following animals during their time with us: 1 Hartmann's Zebra, 1 Burchell's Zebra, 1 Waterbuck, 4 Gemsbok, 1 Red Hartebeest, 1 Blue Gnu, 3 Springbok and 1 Kudu. We remember their hunting week as THE coldest week we had this year. 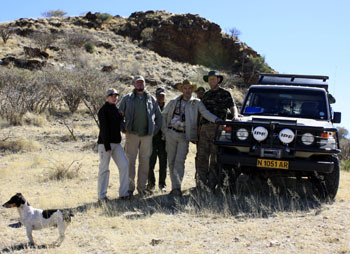 The guys first hunted in the Khomas Hochland mountains near Windhoek for the Hartmann's Zebra. They thought they were going to die in that cold, windy conditions - so high up in the mountains! 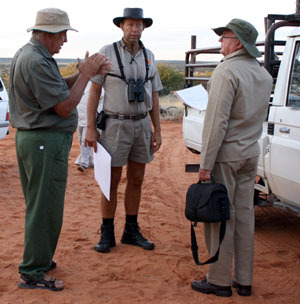 Seems like these Kalahari PH's are sissies...;o) Or what do you say, Dawie?! 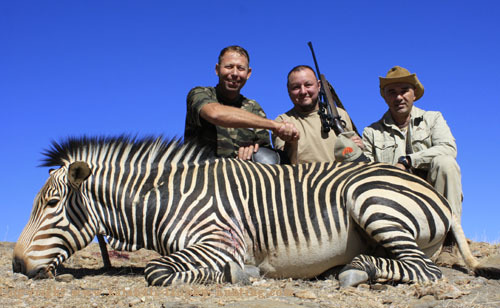 Above: Igor Shakhidzanov got this Hartmann's Zebra on a cold, bright-blue-sky day. Picture on the right: The hunting group. The vehicle is only used here to get the carcass back to the ranch house. Hunting is done on foot or horseback. That evening, just before their drive to Windhoek, someone noticed that 4 of the 6 studs on the Land Cruiser's right front wheel had broken off! We were thankful that this was noticed before their drive. Philip, Michael's brother-in-law, made the long drive after hours to them where he helped prepare the damaged wheel. The hunters arrived ± 01h00 am at their next destination. 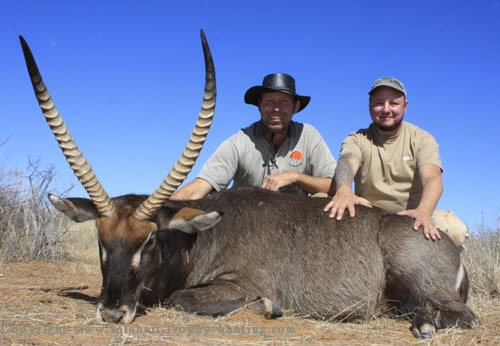 Above: Igor Shakhidzanov with his Waterbuck hunted in central Namibia. This is a very good Waterbuck trophy. Above: Igor with his Blue Gnu aka Blue Wildebeest. 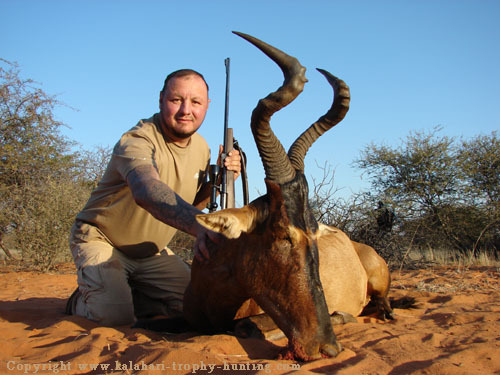 Above: Igor Shakhidzanov with his Red Hartebeest. 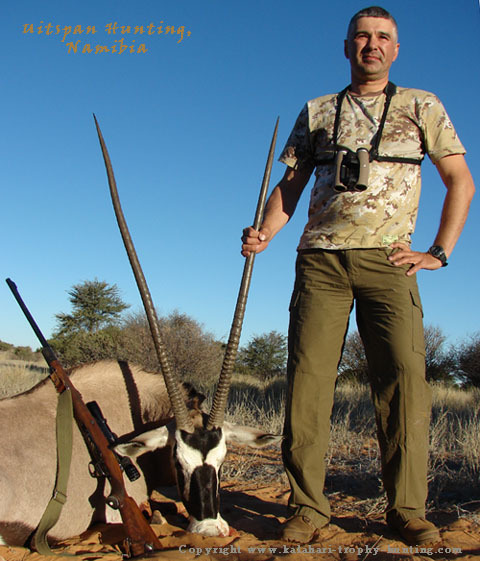 Above: Igor Mikailov with his exceptional Kalahari Gemsbok. The "Igor-group" enjoyed their white wine every night and brought Michael a bottle of Russian Vodka. We still wait for the right opportunity to try it out! Bryce and John Millar from Idaho, USA (we have them this week). You are also welcome to let us know if you would like a list of people who've hunted with us whom you may contact for more information on hunting here. Would you call it wise for a couple to put their children to bed, and then also themselves retire, even though they know that a tornado or earthquake is going to destroy their house in about an hour? Would you then call it an act of wisdom for one who knows that he is going to die to continue to walk in unbelief and sin, when death for such means entrance into an everlasting torment? No, man does wisely when he with the psalmist declares, "O how love I Thy law! it is my meditation all the day. Thou through Thy commandments hast made me wiser than my enemies; for they are ever with me." Psalm 119:97-98. Plainly, true wisdom comes through knowing and loving God's commandments. Loving God's law means loving God, for that is what His law reveals is our calling. And loving God means that we are by Him assured that death brings us closer to Him, with a more blessed covenant life with treasures that are everlasting. How I love Thy law, O Lord! Wise to conquer every foe. Yes, in the measure that we meditate in God's law we are wise and we learn how to walk wisely and seek what has true, lasting value. Sin may bring fleshly pleasure: but it is the height of folly to walk in it. The question is not whether we can amass earthly things which are going to be taken from us when we die. The question is whether we love God and therefore love His law. Meditating in that law we will see the need for Christ: and one who sees that need is truly wise. Him God will assure that in His love He sent Christ to bring us where we in love of God's law will walk perfectly in it in sweet communion with God.